I instantly fell in love with Lake Como when I first visited a decade ago. I recommend it as a must see stop on any tour of northern Italy (well, any trip to Italy for that matter). When you wake up on the lake that first morning, grab an espresso and just sit and watch as the mist hovering in the valley begin to part as the sun rises higher in the sky, revealing bougainvillea draped trellises and the occasional palm tree, delightfully out of place at the base of the Alps. Sigh. Are you planning on traveling there and enjoying la dolce vita too? Below I shared my top five tips for planning a perfect trip to Lago di Como. Spending at least one day aboard a boat is a must-do here, and it’s the best way to see the sites on the lake in a short period of time. While you can navigate pretty easily by ferry, I recommend hiring a boat with a driver. It's a fantastic way to get your own private tour of the lake while you sit back and relax. I love the fact that the driver can just pick you up from the dock of your lakefront hotel or villa maximum convenience. The driver will give you the scoop about what royalty owns which villa, where Bruce Springsteen stays, and yes, even point out George Clooney’s house. Have as many meals outside as you can overlooking Lario (the locals’ name for the lake). 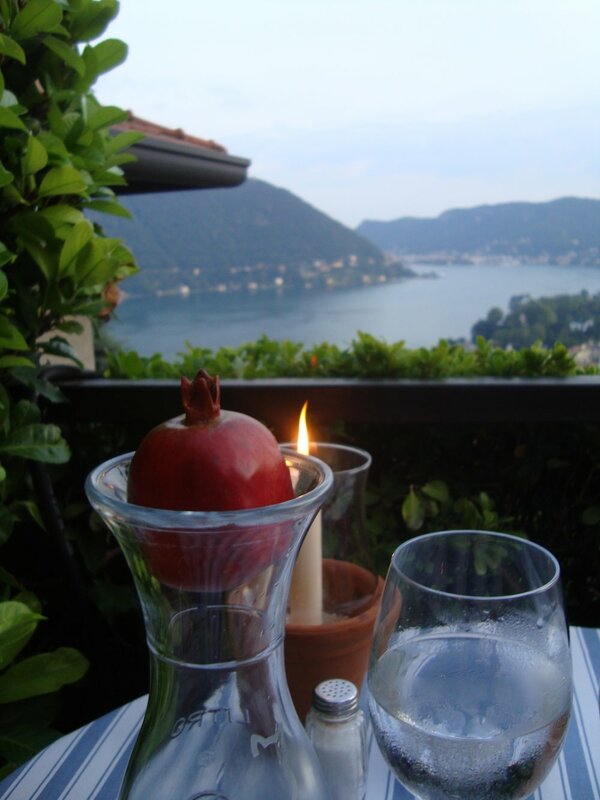 My favorite dinner vista is from the terrace at Il Gatto Nero perched on the mountainside high above the town of Cernobbio along the most southwestern part of the lake. Make reservations just before sunset so you can watch the towns below begin to slowly sparkle with lights as the skies transition to from daylight to twilight. If not within walking distance of where you are staying, I highly recommend getting a driver so you don’t have to worry about navigating switchback roads after a few glasses of wine. While there are some formal gardens you can visit, I prefer to just take in the cascading wisteria and sweet smelling jasmine as they seem to naturally occur along stretching promenades and around the grand villas situated on Lake Como. Each visit I have dinner or drinks at Villa d’ Este so I have an excuse to visit the hotel, where you can walk through the grand stone mosaic walls framing the garden path along the hillside. 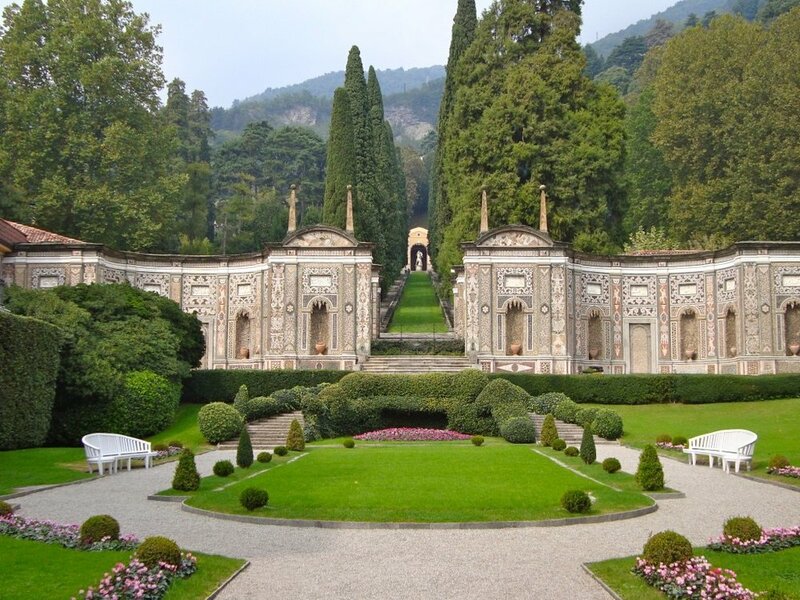 My other favorites include the acres of gardens at Villa Carlotta the whimsical Villa Balbianello, and the charming promenade in Teresio Olivelli Park in the town of Tremezzo. Step off the ferry, drop a pin on your phone, and just get lost in a maze of streets and cafes. Exploring the winding paths by foot, you will discover delightful nooks and crannies of the lake. These off the beaten path spots can be great photo opportunities too. The towns of Moltrosio and Argegno have some great switchback paths and pretty alleyways. Take time to do nothing at all. Grab a bottle of pino nero, your favorite sunglasses and a comfy chaise lounge to bask for an afternoon in the Italian sunshine as the classic wooden boats parade by. Lake Como is a wonderful place to recharge and reawaken your senses. For ultimate experience, stay at one of the handful of hotels with swimming pools that actually float right on the water. Follow along with more of Kristy's adventures on her blog Prosecco and Palm Trees or on Instagram. Traveling to Lake Como this summer? Why not hire us to assist? Travel Italian Style offers custom travel planning for this beautiful region as well as throughout all of Italy (info@travelitalianstyle.com). Kristy + Max in the Beautiful Gardens of Belmond Villa San Michele. Kristy is lives in sunny Florida with her husband, 3 dogs and long awaited son Maxwell. When she's not busy chasing Max around the house, you'll find her happily snapping photos, running marathons or planning her next trip to Italy. Kristy loves sharing style and travel tips, as well as her insights on mom life after infertility on her blog Prosecco & Palmtrees. If you want to drive out into the True Tuscan hills, taste wine and olive oil, and bask under the Tuscan sun, Chianti is the perfect place for you! It is a beautiful and romantic wine region that attracts people from around the globe and takes a little piece of each one’s heart. It’s the ideal place to stay if you want to get away and enjoy the peace in a tucked away historic villa with an easy commute into the larger cities of Florence, Sienna, Lucca, or Pisa. Chianti is a vacation spot that actually feels like a vacation and where you can simply enjoy la dolce vita. Whether your relaxing consists of wine or olive oil tasting, bike rides through the countryside or sitting by the pool at the villa, Chianti will leave you more refreshed than before you came and will keep you coming back for more! How to get there: Depending on what you are doing in Chianti makes a difference in how you want to get there. If you are taking a wine or olive oil tour at a vineyard in the region, then it would be best to arrange transportation with the tour guide or get a car service. However, if you are exploring the city of Chianti, take the SITA bus direct for about 4 euro each way and under a 1-hour drive! About an hour away from Florence lies the small Renaissance town of Lucca. Lucca is full of cobble stone streets, red roofed homes, and piazzas that will never get boring exploring! There are beautiful medieval walls surrounding the city that are just right for the perfect stroll around the city or to have a picnic while enjoying the views of the countryside. You cannot leave without seeing the Cattedrale di San Martino (Lucca’s Duomo). It is covered in marble and frescos on the outside while the inside does not disappoint with its beautiful stained glass. For quite a small city, it will be sure to leave a big impact. How to get there: You can take the train from Santa Maria Novella Train Station in Florence to Lucca for about 7.50 euros and it is about a 1.25-1.75-hour trip. You can also take the LAZZI bus from the train station to Lucca’s train station and then bus depot.This trip is also about 1.25 hours. Note: there are no Sunday busses from Florence to Lucca. Siena is one city that will leave you breathless. Standing in the middle of Piazza del Campo is a memory that I will never forget. As I watched children chasing birds, families sitting in the square eating gelato, and looking up to the tower with the bright blue sky behind it, my heart grew a few sizes bigger for this beautiful country. Siena is home to the Palio horse race and was even the setting for the James Bond movie, Quantum of Solace. The Siena Duomo is definitely worth seeing. If you climb to the top of the tower, you can get an incredible view of the medieval paradise below! How to get there: Take the SITA bus from just across the street from the Santa Maria Novella Train Station in Florence and arrive at Piazza Gramsci inside Siena’s old city walls. It takes about 1.25 hours and costs roughly 6.50-7.00 euro per ride. You may take the train but Siena’s train station is about 2km outside the center, so you would have to take a bus into it anyway. The train also is a bit more expensive, 6-10 euro, and takes 1.5 hours. Mine as well kill 2 birds with one stone and take the bus from the beginning! Just an hour and a half east of Florence is where Cortona lies. This hilltop city overlooks both Umbria and Tuscany. This medieval city is the setting for the book and the movie Under the Tuscan Sun, and depicts the idea everyone has in their head of the true Tuscan hills. It is one of the oldest hill towns but is still up to date and very welcoming to all tourists. Cortona is definitely a town that you should lose the map and get a bit lost in to find the best hole in the wall shops and restaurants! How to get there: Take a regional train from the Santa Maria Novella Train Station in Florence to Cortona. Tickets are about 11 euro and the ride is about 1.5 hours. No need for train reservations on a regional train. Travel is all about the experience, so make your travel experience better by considering a vacation with a luxury tour group. If you’re being honest, you’re probably a little hesitant to take sign up for a luxury group tour because you just don’t know if there are any benefits. Right? In actuality, luxury group tours are meant to provide a plethora of benefits for travelers with a single goal of helping the traveler to have an amazing and enjoyable experience. When traveling with a luxury tour group, you’re sure to spend less time worrying about what you should do for the day and more time actually experiencing the destination. Less planning also means that you won’t be worrying about where you’re staying. Your luxury tour planner will not only have an excellent place for you to catch up on some sleep, but will also make sure that your needed accommodations are met. Oh, and don’t worry about losing your hotel room or villa suite because of some booking confusions (which I’m sure frequent travelers are all too familiar with). Your luxury travel planner will not only confirm, re-confirm and then confirm again, but will also make sure any booking problems once you’ve arrived are all taken care of. Can I get a, heck yes? Your luxury group tour guide probably knows the in’s and out’s of your destination like the back of their hand. This also means they probably have connections to things like unique places to stay, activities not many people get to do and access to authentic local restaurants or vineyards. Your luxury group tour guide will also have most likely experienced much of your destination first hand giving them an uncanny ability to point you towards things like the best gelato in the city or the small village with the best pizza. You’re single and you want to travel, but you’re afraid you can’t do it on your own. You’re left asking yourself questions like what if something happens to me while I’m traveling? If I get sick how will I take care of myself? Once I get to my destination, how will I be able deal with the language barrier? Signing up for a luxury tour group can help you get over all of those fears. No need to put off travel just because you have no one who shares your same traveling desires, a luxury tour group will be filled with people you can relate to and get to know (maybe you’ll even meet your new best friend or a great traveling partner for future trips!). And when it comes to a language barrier, you won’t be dealing with it alone. Not only will your luxury tour group leader be able to help, you’ll also be surrounded by others who may be able to help. Okay, okay. Maybe this isn’t a super important benefit of a luxury tour group, but if we’re being honest travel pictures are the best. So having someone there to snap that pic of you by the waterfall or that pic of you and your significant other cuddling under the Eiffel Tower, is an added bonus, right? What do you think are some benefits of traveling with a luxury group tour? Share your thoughts in the comments below! Halie is the Travel Marketing Trends Coordinator for Travel Italian Style and is currently a senior at College of Charleston in Charleston, SC where she is majoring in English with a concentration in Creative Writing. Living in Charleston, Halie developed a love for beautiful scenery and unique culture. This love led her to her passion for travel which allows her to discover beautiful scenery and unique cultures in places all over the world. When she is not daydreaming about her next traveling adventure she can be found redoing warn out furniture found on the side of the road, writing fiction and attempting Pinterest crafts.